Displacement of air caused by variations in pressure between two regions of the atmosphere. Symbol of a wind blowing between 88 and 96 km/h. Symbol of a wind blowing between 14 and 22 km/h. Symbol of a wind blowing between 5 and 13 km/h. Symbol of a wind blowing at a speed lower than 5 km/h. 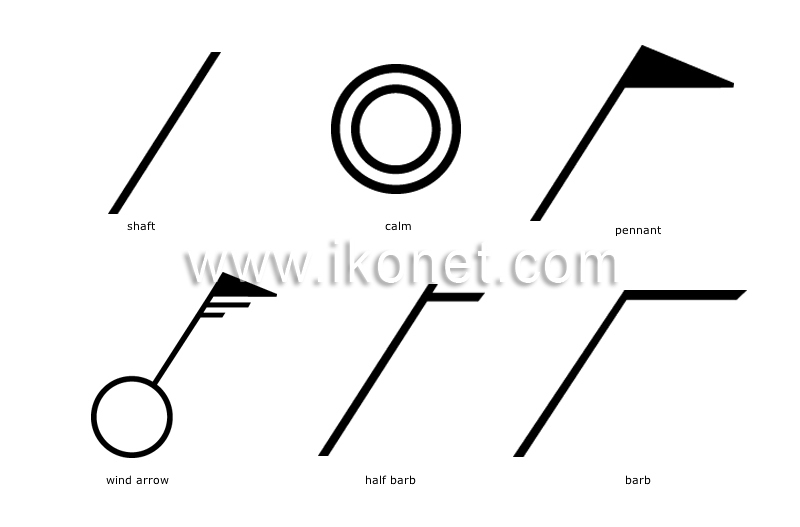 Symbol that uses the position of the shaft to indicate wind direction and the number of barbs and pennants to indicate wind speed. Symbol indicating the absence of wind.